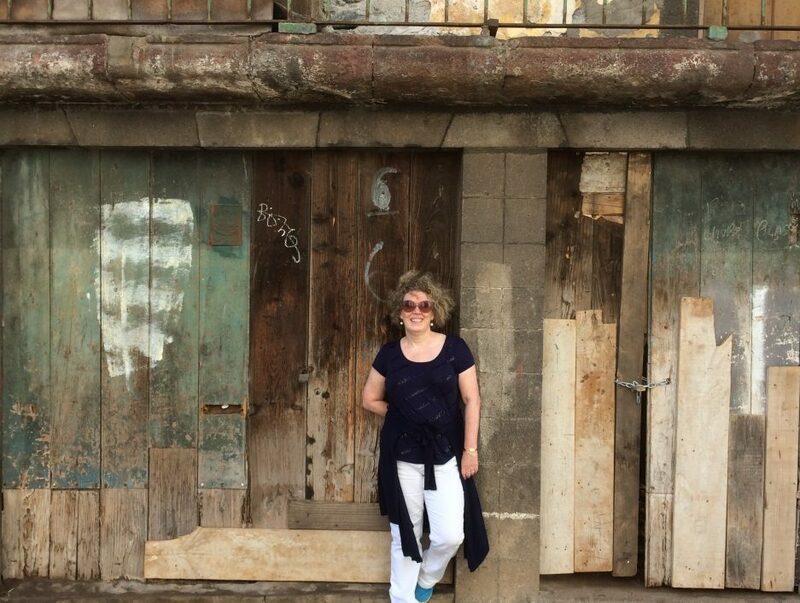 I’ve written about a few things I’ve enjoyed in March. This is a round up of the rest. This set was a Christmas gift from my niece as she remembered that I wanted to try it. I have very curly, unruly hair with a tendency to frizz, so I approached a lady in the gym who has fabulous curly hair and asked her what she uses. Aveda is the answer it seems! The first thing to mention is that the shampoo does not lather – this is a good thing as it indicates a lack of nasties that strip the hair of oil. Once you get used to the feeling that you are not scrubbing your hair clean, then it’s fine. The conditioner is nice and thick and you only need to use a small amount (good job as it’s expensive). The curl enhancer is a real miracle worker for me as I dry my hair naturally most of the time and this keeps it relatively under control as it dries. I use it when my hair is still wet, but also as a top up to control frizz in the day. This was a treat to myself and smells fabulous! I don’t know what it is about Rituals but everything I try is just delicious so I’m working my way through the range. Once I started with this method of cleansing, there was no going back, although I have bought in extra supplies of lovely white face flannels as the bottle only comes with two. There is a new rose scented one out which I plan to buy next. I’ll probably finish this page turner in bed tonight. I love the characters as they are definitely more naughty than nice. I read this on holiday and devoured it. Reminds me a bit of The Reader. Understated, but you can really feel Anna’s pain at being trapped in her unhappy life. Looking forward to April as there are lots of adventures lined up! 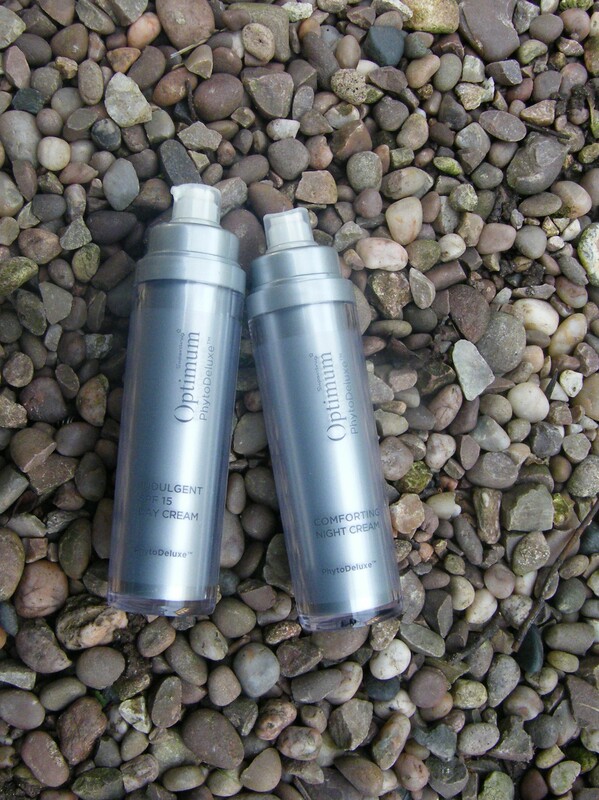 Optimum PhytoDeluxe is the latest skincare development from Superdrug. Aimed at the over 40 market it has the look, feel and performance of a luxury product, but with a £14.99 price tag. Superdrug kindly sent me both the day cream and night cream to trial, and I have to say I’m delighted with them. They remind me very much of (dare I say it) a moisturiser I often buy from Clarins, which gives my credit card a battering every now and then. Optimum PhytoDeluxe contains black diamond truffle which is rich in amino acids as well as platinum particles which help improve the synthesis of collagen (the stuff that holds our face together). Synthesis is the term for making things happen in the body and as we age, this process of making collagen (which is a protein) becomes less effective, hence the sagging and wrinkles! So anything which improves our ability to continue making enough collagen has got to be good. I love this product and it is my new ‘go to’ for a number of reasons. Both the day and night cream are a good thick texture and feel really nourishing on the skin. The pump action dispenser avoids fingers in the pot. As with all of Superdrug’s own brand products, it is certified as cruelty free. As we were going on a no frills holiday, I decided to pack heavenly rose fragranced beauty products so that I had that feeling of being cossetted. The Jo Malone Red Roses soap (in the box) is gentle on the skin and is much nicer to handle than the tiny slivers of hard packaged soap you get in hotels. I chose Dr Organic Rose Otto shampoo, conditioner and body wash for bath time pampering so I had a real hit of rose! For daytime facial moisturising I took my old favourite Clinique City Block SPF 40 – no way I’m getting sun on my face. People used to laugh at me in my twenties for sunbathing with a towel over my face, but it’s paid off as I’m not really that wrinkled for my age! 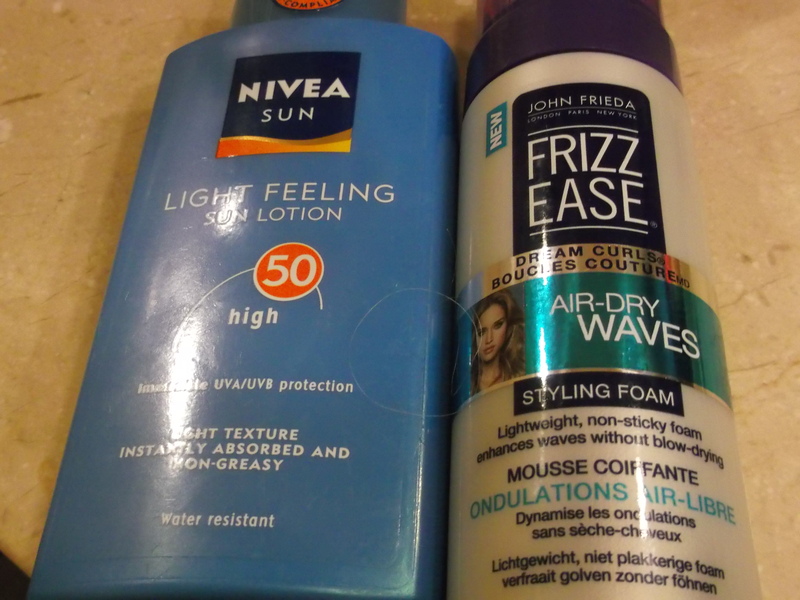 My body doesn’t see the sun much either as I don’t sunbathe at all these days, so I use SPF50 on just the exposed bits (not pictured, but Nivea). For night time facial care I took Rosehip Plus Australian cold pressed rosehip oil which, to save room in the case, also served as a heavy duty body moisturiser. This is more dense than I normally use, but for sunny climates, I over compensate on the moisture to make up for water loss through heat. The Cowshed hand lotion is small enough for my handbag and does double duty for feet. This one is called ‘Cow Pat’ with grapefruit and lavender. Smells better than it sounds. To tame my curls I took Dove Youthful Vitality BB cream. Humidity levels were high so my very curly hair grew bigger and bigger as the week went on, but this tamed it enough to look reasonably tidy to go out. I don’t bother with a hairdryer or brush on holiday and just leave my hair a curly mess. I also took Philip Kingsley dry shampoo as my hair is better not washed every day, but because of the heat and humidity I felt compelled to wash it and only used dry shampoo once. I had a tiny sample of Laura Mercier face polish which I used once, but don’t recommend as it stung my eyes. 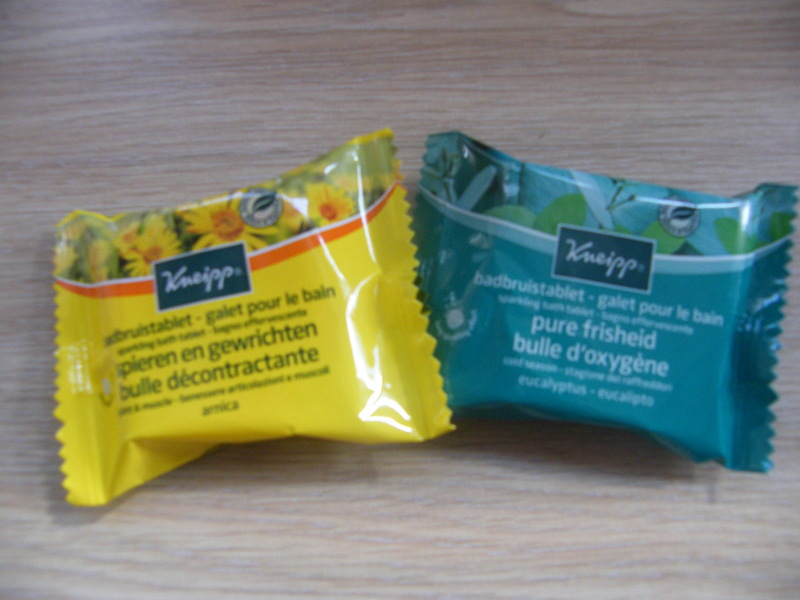 Finally, I took a sparkling bath tablet from Kneipp which was sent to me as a gift from Graftons. These are packed with essential oils and the scent of this one filled the bathroom with Eucalyptus – perfect for relaxing after a long walk. I’m always interested to hear what other people take on holiday. Any top tips? I’m no sun lover, in fact, most of my holiday is spent reading a book under a tree. 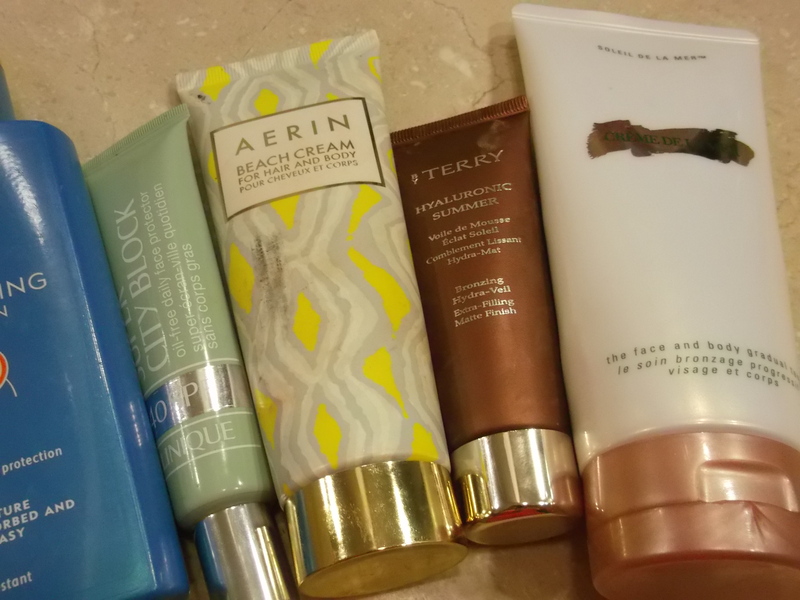 That doesn’t mean however that I don’t like to look sunkissed, so these are the products I take with me on a sun, sea and sand break. 1. For body, I use Nivea SPF50 sun cream. It smells nice and gives good thick coverage. 2. For my face, I choose Clinique City Block SPF 40. I wear this at home too. It has a slight tint and keeps wrinkles at bay. My husband uses it too (although I wish he’d get his own). 3. Aerin Beach Cream for Hair & Body. My hair is frizzy and dry in hot climates so this calms it and adds a subtle glow. I also pop it on my shoulders for a bit of shimmer. 4. By Terry Hyaluronic Summer. This wash off fake tan is great for topping up my gradual tanner – for when you need a bit of extra colour in the evening. 5. Crème de la Mer gradual tanner for face and body. This gives a very subtle colour that builds up over a few days, although my application technique leaves much to be desired and I suffer from orange ankle stripes now and again. I wouldn’t dare use fake tan on my face! 6. Frizz Ease Air Dry Waves. I don’t touch a hairdryer on holiday so this product is ideal for keeping my curls under control. 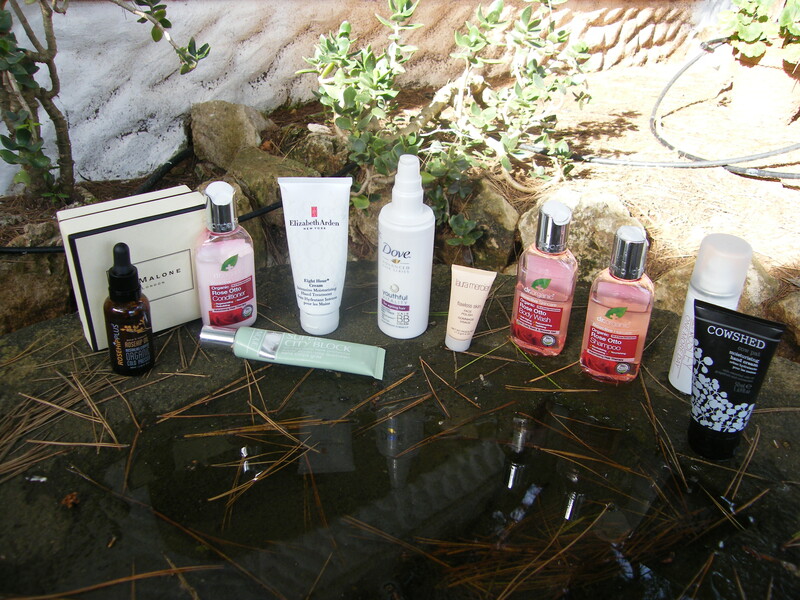 I love reading about holiday must haves so if you have any top tips for curly hair and a freckly complexion, fire away!